In addition to the standard HTML form elements, Dreamweaver supports custom controls to help you create flexible, professional-looking interfaces. Editable select lists (also known as combo boxes) lets you combine the functionality of a select list with the functionality of a text box. Extension UIs often contain pop-up menus that are defined using the select tag. In Dreamweaver, you can make pop-up menus in extensions editable by adding editable="true" to the select tag. To set a default value, set the editText attribute and the value that you want the select list to display. When you use select lists in your extensions, check for the presence and value of the editable attribute. If no value is present, the select list returns the default value of false, which indicates that the select list is not editable. As with standard noneditable select lists, editable select lists have a selectedIndex property (see Objects, properties, and methods of the Dreamweaver DOM). This property returns -1 if the text box is selected. To read the value of an active editable text box into an extension, read the value of the editText property. The editText property returns the string that the user entered into the editable text box or the value of the editText attribute. If no text has been entered and no value has been specified for editText, it returns an empty string. Editable select lists are available in Dreamweaver. 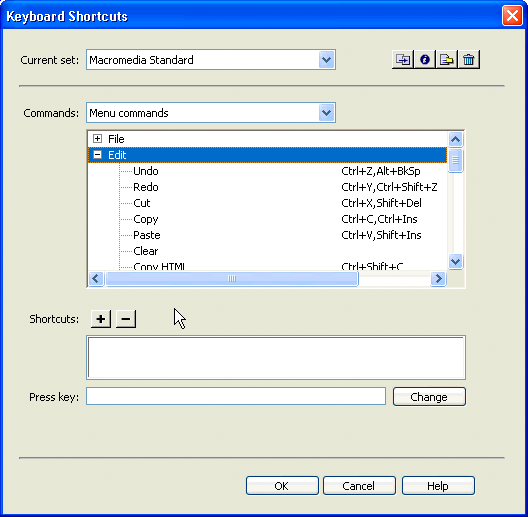 Create a new blank file in a text editor. Save the file as EditableSelectTest.htm in the Dreamweaver Configuration/Commands folder. When you select a value from the list, an alert message displays the index of the value and the text. If you enter a value, an alert message indicates that nothing is selected. Database controls facilitate the display of data hierarchies and fields. Using Dreamweaver, you can extend the HTML select tag to create a database tree control. You can also add a variable grid control. 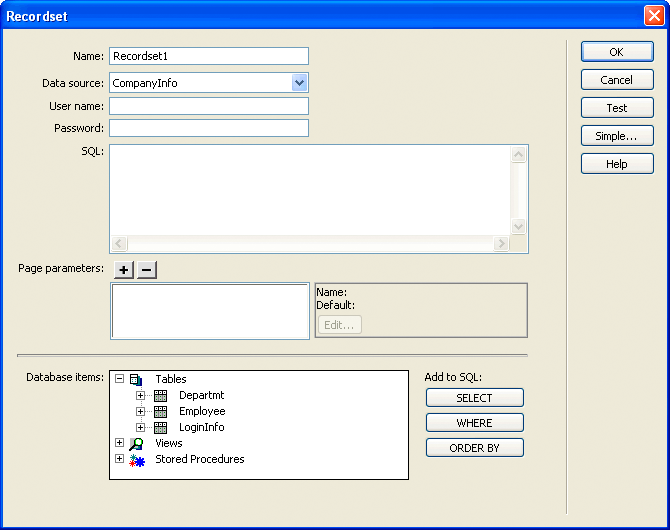 The database tree control displays database schema, and the variable grid control displays tabular information. Name of the database connection that is defined in the Connection Manager; if empty, the control is empty. When this attribute is specified, the tree control does not draw the expand Plus (+) or collapse Minus (-) indicators or the associated arrows on the Macintosh. This attribute is useful for drawing multicolumn list controls. When this attribute is specified, the tree control displays a header at the top that lists the name of each column. Any option tags that are placed inside the select tag are ignored. Width of each column, each separated by a comma. The columns are of equal width if you do not specify widths. columns="Name,SQL Data Type,Direction, Default Value,Run-time Value"
Tree controls organize information into expandable and collapsible nodes. MM:TREECOLUMN is an empty, optional tag that defines a column in the tree control. MM:TREENODE is an optional tag that defines a node in the tree. It is a nonempty tag that can contain only other MM:TREENODE tags. Contains the content for the given node. For more than one column, this is a pipe-delimited string. To specify an empty column, place a single space character before the pipe (|). Specifies that the node is expanded or collapsed with the strings "expanded" or "collapsed". You can select multiple nodes by setting this attribute on more than one tree node, if the tree has a MULTIPLE attribute. Tree controls and the nodes within them are implemented as HTML tags. They are parsed by Dreamweaver and stored in the document tree. These tags can be manipulated in the same way as any other document node. For more information on DOM functions and methods, see The Dreamweaver Document Object Model. To add a node to an existing tree control programmatically, set the innerHTML property of the MM:TREECONTROL tag or one of the existing MM:TREENODE tags. Setting the inner HTML property of a tree node creates a nested node. To add a child node to the currently selected node, set the innerHTML property of the selected node. To delete the currently selected node from the document structure, use the innerHTML or outerHTML properties. Color button controls let you add color picker interfaces to your extensions. In addition to the standard input types such as text, check box, and button, Dreamweaver supports mmcolorbutton, an additional input type in extensions. Specifying <input type="mmcolorbutton"> in your code causes a color picker to appear in the user interface. You can set the default color for the color picker by setting a value attribute on the input tag. If you do not set a value, the color picker appears gray by default and the value property of the input object returns an empty string. A color button has one event, onChange, which is triggered when the color changes. In this example, the user changes the value of the text box and then tabs or clicks elsewhere. Then, the color picker updates to show the color that is specified in the text box. Whenever the user selects a new color with the color picker, the text box updates to show the hexadecimal value for that color.